Holidays can be stressful. It can be hard to decide the best fashion to bring with you. You want to have space left over in your suitcase therefore what you bring must be multi- functional. In this article I will help you make these decisions less difficult. Swimwear is a holiday essential. Pop down to the Quays and get this beautiful red ditsy flower under-wired swimsuit in Debenhams. Perfect for sunny days at the beach and swimming pool. You could put some denim shorts over this swimsuit and wear it elsewhere. I adore the girly floral pattern and it is great for those who dislike bikinis. When on holidays everyone needs a staple summer dress that you can wear all the time. I love boohoo.com’s Phoebe tie dye print scoop neck skater dress. The blue pattern will make you stand out on the beach and it is easy to wear. Just pop it over your swimsuit and go. You can’t forget a stylish pair of sunglasses to complete your vacation look. Topshop’s hexagon rimless sunglasses are right on trend and jazz up any outfit. These sunglasses are handy as they bring every outfit up to trend. And finally sandals. They are a must have for holidays. Wedges are the way to go this summer with the hottest celebrities wearing them. Millie Mackintosh was seen sporting the trend on vacation . 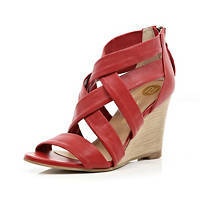 These red strappy wedges from River Island are perfect during the day, but also you can wear them at night. Team them with a floral maxi dress during the day, and wear them with a tropical printed bralet at night.